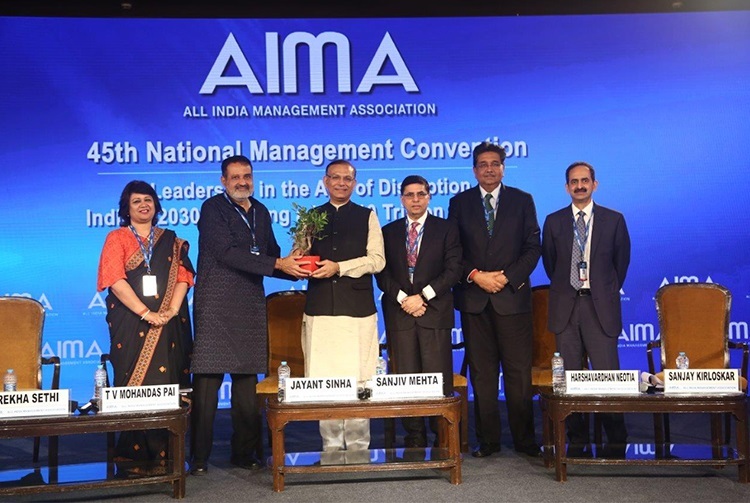 AIMA held its 45th National Management Convention (NMC) on 26-27 September 2018 on the theme ‘Leadership in the Age of Disruption India @2030: Creating a USD 10 Trillion Economy’. In a special session of Aap Ki Adalat with Mr Rajat Sharma, Mr Nitin Gadkari, Minister of Road Transport & Highways, Shipping and Water Resources, River Development & Ganga Rejuvenation, Government of India said, Indian democracy's tradition is ‘matbhed’, not ‘manbhed’. “We should fight on ideology and programmes and all parties should raise the level of politics,” he said. In a video message, Mr Suresh Prabhu, Minister of Commerce & Industry and Civil Aviation, Government of India, said that India is poised for a huge growth. "In aviation, we are trying to make airplanes in India. Around 100 airports will come up in the next 15 years with the investment of 65 billion dollars. I am preparing a vision for aviation for 2035 to make it globally competitive and the leading industry of the country. All these transformative measures are going to help India grow," he said. Guest of honour Mr Jayant Sinha, Minister of State for Civil Aviation, Government of India, expressed his opinion on Farm to Frontier: A Unique Development Model for India. In keynote address, Mr M J Akbar, Minister of State for External Affairs, Government of India, spoke about disruption and pillars of modernisation for India. Mr T V Mohandas Pai, President, AIMA and Chairman, Manipal Global Education Services; set the tone for the two-day convention. 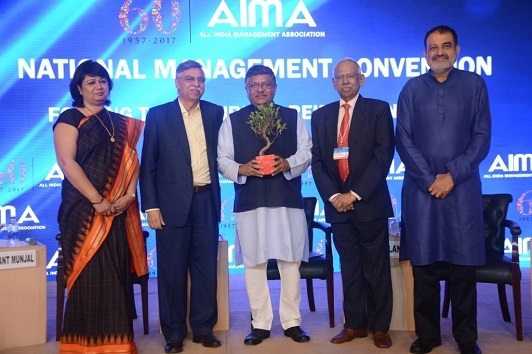 Ms Rekha Sethi, Director General, AlMA, Mr Sanjiv Mehta, Convention Chairman, and Chairman & Managing Director, Hindustan Unilever Limited, and Mr Harshavardhan Neotia, Senior Vice President, AIMA and Chairman, Ambuja Neotia Group, also spoke on the occasion. Mr Sanjay Kirloskar, Vice President, AIMA, and Chairman and Managing Director, Kirloskar Brothers Ltd concluded the inaugural session. Some of the eminent speakers who addressed the NMC included Mr Amitabh Kant, CEO, NITI Aayog, Government of India; Mr Sunil Kant Munjal, Immediate Past President, AIMA and Chairman, The Hero Enterprise; Mr Kishore Biyani, Founder and Group CEO, Future Group; Mr Baba N Kalyani, Chairman & Managing Director, Bharat Forge Ltd; Mr Omkar Goswami, Founder & Chairperson, CERG Advisory Private Ltd; Mr Akhil Bansal, Deputy CEO, KPMG in India; Ms Shereen Bhan, Managing Editor, CNBC TV-18; Mr P Balaji, Chief Regulatory and Corporate Affairs Officer, Vodafone Idea Ltd; Ms Supriya Shrinate, Executive Editor-News, ET NOW; Mr Vineet Agarwal, Managing Director, Transport Corporation of India Ltd; Mr Pranav Pai, Founding Partner and Chief Investment Officer, 3one4 Capital; Mr Ayaan Ali Bangash, Sarod Master & Composer; Mr Jayant Prasad Paleti, Co-Founder, Darwinbox; Mr Roshan Shankar, Advisor to the Government of NCT of Delhi and Member, Aam Aadmi Party; Mr Pranjal Sharma, Author, Kranti Nation: India and the Fourth Industrial Revolution; Mr Ravi Uppal, Former Managing Director & Group CEO, Jindal Steel & Power and Mr Rahul Gangal, Partner, Roland Berger. AIMA-KPMG Management Capability Development Index India Report 2018, AIMA-PwC Report on How Artificial Intelligence is Reshaping Jobs in India and another AIMA-PwC Report on Disruptive Technologies that can Transform India were also released on the occasion. "Folding the Future In:Reimagining India"
Speaking on day one of the NMC, Mr Nitin Gadkari, Minister of Road Transport & Highways; Shipping and Water Resources, River Development and Ganga Rejuvenation, Government of India shared that nothing is impossible if we have a strong political will, appropriate vision, fast track decision making process, 100 per cent transparency and zero tolerance against corruption. Mr Ravi Shankar Prasad, Minister of Law and Justice; Electronics and Information Technology, Government of India addressed the second day of the NMC. "Young people, who are full of ideas and confidence, are brimming with hope and we are creating enabling atmosphere for them," he shared. He also mentioned measures that have been taken for digital inclusion in the judicial system. Mr Babul Supriyo, Minister of State for Heavy Industries and Public Enterprises, Government of India, in his keynote address, said that patience and solidarity towards honest endeavours of the government are required. Elaborating the theme, Mr Sunil Kant Munjal, President, AIMA and Chairman, The Hero Enterprise said: "It's not just the competition one has to work on in the industry but also think of who is getting to the future first." The Diamond Jubilee NMC was co-chaired by Mr Sudhir Jalan, Chairman, Neo Foods Pvt. Ltd.
A Special First Day Cover and Postage Stamp to commemorate AIMA's Diamond Jubilee Year was released. AIMA's Diamond Jubilee Convention Souvenir was also released on the occasion. Some of the other speakers who addressed the NMC included Mr Amitabh Kant, CEO, NITI Aayog, Government of India; Mr TV Mohandas Pai, Senior Vice President, AIMA and Chairman, Manipal Global Education Services; Ms Rekha Sethi, Director General, All India Management Association; Mr Sanjay Kirloskar, Chairman & Managing Director, Kirloskar Brothers Ltd.; Ms Preetha Reddy, Executive Vice Chairperson, Apollo Hospital Enterprise Ltd; Lord Karan Bilimoria CBE DL, Chairman, Cobra Beer Partnership; Mr Rajiv Kumar, Vice Chairman, NITI Aayog, Government of India; Mr Arnab Goswami, Founder & Editor-in-Chief, Republic TV; Mr Raamdeo Agrawal, Jt. Managing Director, Motilal Oswal Financial Services Ltd; Ms Supriya Shrinate, Executive Editor – News, ET Now; Mr Akhil Bansal, Deputy CEO, KPMG in India; Mr Rakeysh Omprakash Mehra, Film Director, Producer, Screenwriter; Mr Pranav Pai, Founding Partner and Chief Investment Officer, 3one4 Capital; Mr Kiran Menon, Co-Founder & CEO, Tydy; Mr Jayant Prasad Paleti, Co-Founder, Darwinbox and Mr Rishabh Kaul, Co- Founder and Head of Demand Marketing, Belong. In a live session of Aap ki Adalat, Baba Ramdev, Yoga Guru and Founder, The Patanjali Group of Institutions, was interrogated by Mr Rajat Sharma, Chairman and Editor-in-Chief, India TV, and he defended himself against all the allegations in his trademark style, regaling the audience. AIMA’s Honorary Life Fellowship was awarded to Mr Firdose Vandrevala, Past President, All India Management Association. The AIMA-R K Swamy High Performance Brand Award 2017 was also presented to Mr Raveesh Bhatia, Executive Vice President & Head of Corporate Banking, HDFC. Best Local Management Associations Awards were also presented on the occasion. 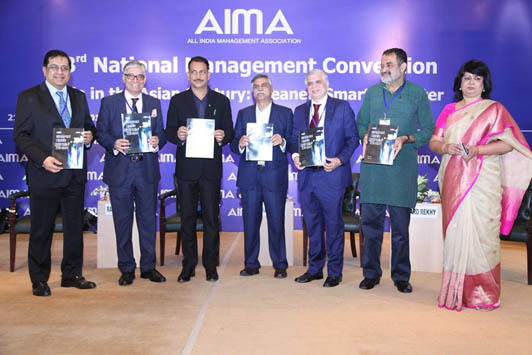 "India in the Asian Century: Cleaner, Smarter, Faster"
AIMA’ s flagship event - The National Management Convention – 43rd in the series was held in New Delhi on 21st – 22nd September, 2016 at Hotel Le Meridien, New Delhi. The National Management Convention is the flagship event of the AIMA and this mega annual event aims to focus on the challenges faced by the Corporates in India, their implications on the business scenario and deliberates on key strategies for successful business performance. The theme of this year convention was “India in the Asian Century: Cleaner, Smarter, Faster”. Some of the eminent speakers who had addressed the Convention include :Manohar Parrikar, Minister for Defence, Government of India; Ravi Shankar Prasad, Minister of Law & Justice, Electronics & Information Technology, Government of India; Suresh Prabhu, Minister of Railways, Government of India; Rajiv Pratap Rudy, Minister of State (I/C) of Skill Development and Entrepreneurship, Government of India; Rajyavardhan Singh Rathore, Minister of State of Information & Broadcasting, Government of India; Kamal Nath, Member of Parliament (Lok Sabha) and Former Minister of Urban Development, Government of India; Sunil Kant Munjal, Senior Vice President, AIMA and Chairman, Hero Enterprise; T V Mohandas Pai, Vice President AIMA and Chairperson of the Board, Manipal Global Education Services Private Ltd; Sanjiv Goenka, Chairman, RP-Sanjiv Goenka Group; D Shivakumar, Chairman & CEO – India Region, PepsiCo Holdings India Pvt Ltd; Sudhir Jalan, Chairman, Neo Foods Pvt Ltd; Harshavardhan Neotia, Chairman, Ambuja Neotia Group; Naresh Trehan, Chairman & Managing Director, Medanta - The Medicity; Sanjeev Bikhchandani, Founder and Vice Chairman, Naukri.com; Arvind Lal, Chairman and Managing Director, Dr Lal Pathlabs Ltd; Richard Rekhy, Chief Executive Officer, KPMG in India; Deep Kalra, Founder, Chairman & Group CEO, MakeMyTrip.com; Rajeev Talwar, CEO, DLF Ltd; Mangu Singh, Managing Director, Delhi Metro Rail Corporation Ltd; Suman Bose, Managing Director – India, Siemens Industry Software (India) Pvt Ltd; Prashant Singh, Managing Director, Nielsen India;Siddharth Pai, Managing Partner, Tekinroads Consulting LLP; Umakant Soni, Founding Partner, Pi Ventures; Anupam Sibal, Group Medical Director, Apollo Hospitals Enterprise Ltd; Supriya Shrinate, Chief Editor – News, ET Now ;Pranjal Sharma, Host – The Appointment, Zee Network and Sharat Sharma, Co-founder and Governing Council Member, iSPIRT Foundation; Sonali Krishna, Anchor & Editor, ET Now; Syna Dehnugara, Co-author, Young Turks & Features Editor, CNBC-TV18 and Chris Parsons, Chairman, India Practice, Herbert Smith Freehills. AIMA Managing India Awards for Outstanding PSU of the Year was presented to Delhi Metro Rail Corporation Ltd.
AIMA - R K Swamy High Performance Brand Award 2016 was presented to Tata Sons. 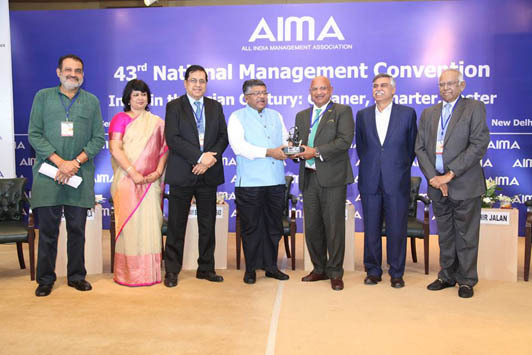 AIMA presented awards to Local Management Associations.